This post is part of our ‘Shielding the Messengers’ series, which examines issues related to intermediary liability protections, both in the U.S. and globally. Without these protections, the Internet as we know it today–a platform where diverse content and free expression thrive–would not exist. Last week, I had the honor of speaking on a panel at the Foreign Correspondents’ Club of Thailand in Bangkok on an issue of grave importance to global internet freedom and the internet economy: the issue of intermediary liability. Intermediary liability poses a global threat to online free expression. We’ve seen it in Italy, where Google executives were criminally convicted of privacy violations based on a user’s uploaded video. We’ve seen it in India, where prosecutors have essentially put the Internet on trial by criminally charging major internet companies like Facebook for not censoring allegedly blasphemous speech posted by their users. And we’ve seen it in Thailand, where Ms. Chiranuch Premchaiporn, director of the popular online newspaper Prachatai, is facing the possibility of decades in prison based on comments posted by Prachatai’s users that have been deemed insulting to the King of Thailand. Ms. Premchaiporn, also known by the nickname “Jiew“, is currently waiting for the verdict in her case to be announced on April 30th. Meanwhile, the Thai Ministry of Information and Communication Technology (MICT) is drafting potential revisions to the primary law under which Jiew has been charged, Thailand’s Computer Crime Act (CCA), and as explained in CDT’s new analysis of draft amendments to the CCA that we obtained in December, those revisions threaten to increase the already substantial legal risks faced by internet users and intermediaries alike. With the issue of intermediary liability currently front and center in Thailand, we agreed with Google’s policy team in Asia that it would be a good time to put together a local event focused on the issue. Since the issue of intermediary liability is so often discussed as a threat to free expression, we thought this would be a good opportunity to focus on the other major threat posed by intermediary liability, as laid out in CDT’s 2010 paper on the subject: the impact on the internet economy. 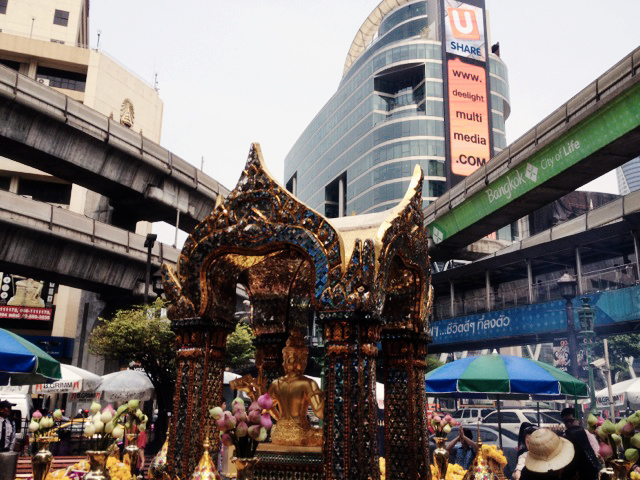 At the Erawan Shrine in downtown Bangkok, a block away from the Foreign Correspondents’ Club of Thailand, the Hindu creation god Brahma sits in peaceful contrast with the hi-tech hustle and bustle of the modern city. 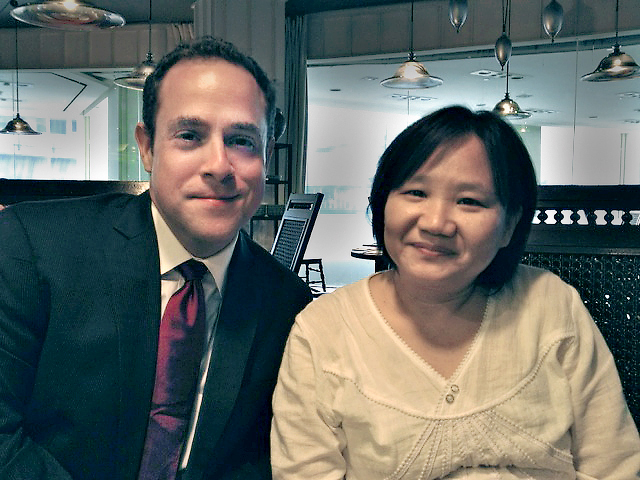 So, last week, I flew halfway across the world and 11 hours into the future to Bangkok, Thailand’s “city of angels”, where I had the honor of meeting Jiew for tea before Thursday night’s panel discussion at the Foreign Correspondents’ Club of Thailand. That panel, skillfully moderated by local American journalist Newley Purnell, led off with my introduction to the issue of intermediary liability with a focus on its economic impact. I was followed by Dr. Pirongrong Ramasoota of Chulalongkorn University, who provided in-depth background on the state of the law in Thailand (this essay of hers on Internet Politics in Thailand after the 2006 Coup is well worth reading). Next was Mr. Wanchat Bhadungrat, founder of the popular Thai discussion board Pantip.com, to discuss the legal uncertainty and challenges faced by user-generated content platforms based in Thailand, with Google’s head of policy for Southeast Asia, Ann Lavin, discussing how the issue of intermediary liability impacts global businesses like Google. The entirety of my fifteen-minute opening presentation is reprinted below. Thanks again to my co-panelists and to the Foreign Correspondents’ Club of Thailand for allowing me to visit Bangkok and deliver CDT’s perspective on this critical global issue, and thanks to Jiew for taking the time to meet with me. Her unflagging grace and courage under such trying circumstances is a continuing inspiration. We at CDT stand with her as she awaits the verdict in her case, which will have grave implications not only for her life but also for the continued vibrancy of free expression and the Internet economy in Thailand. Good evening and thank you for coming tonight, and for allowing me to speak with you. My name is Kevin Bankston, and I have been privileged to spend my entire career working on issues of Internet policy at esteemed civil society organizations in the United States, first at the American Civil Liberties Union or “ACLU” in New York City, then as a senior attorney at the Electronic Frontier Foundation or “EFF” in San Francisco, and now as the Director of the Free Expression Project at the Center for Democracy & Technology or “CDT” in Washington, DC. I am honored that I was invited to be here in Bangkok tonight, in the company of such esteemed experts, to discuss the important issue of intermediary liability and the role that it plays in the Internet economy. The idea that Internet intermediaries deserve protection against liability when their users break the law may seem like a new idea, because it deals with new technology. However, this idea is based on a simple and long-standing principle, a principle that is literally thousands of years old both in the East and in the West. In the West, we express this principle as a piece of advice: “Don’t shoot the messenger.” When we say that, we are suggesting that the person who carries a message should not be punished simply because the recipient finds the message displeasing. There are at least two good reasons to take this advice: first, shooting the messenger is fundamentally unfair; the messenger did not create the message, he simply did his job by carrying it. Second, when you punish the messenger, you threaten your own ability to receive important information. We see this lesson illustrated both in ancient Western and Eastern history. As described by the great Roman historian Plutarch, there once was an ancient Armenian emperor, Tigranes the Great, who beheaded the messenger that informed him that the Romans were invading his kingdom. After that, no man dared to bring Tigranes any other message that might displease him, and without any information at all, he remained ignorant of the war that raged around him. The ancient Chinese recognized this same risk: that punishing messengers would ultimately prevent the receipt of important communications. That is why, over two thousand years ago during the Warring States period, it was Chinese custom—driven by honor, virtue, and common sense—that after receiving a message from one’s enemy, the enemy’s messenger would be allowed to leave unharmed. The ancient Chinese recognized that if messengers were punished, communication between enemies would cease, and an end to war could never be negotiated; they recognized that punishing messengers threatened the act of communication itself. Unfortunately, as we shall see, the modern Chinese have not been so wise. I searched for it on Google, and then read about it on Wikipedia. The search engine Google, that helps us navigate the vast World Wide Web, and Wikipedia, the unprecedented, user-generated encyclopedia with over 21 million articles written in 283 languages, are themselves messengers. Those services, and services like Facebook, and Twitter, and YouTube, and email providers and web hosts and Internet access providers, are all modern messengers. And these modern communications intermediaries, along with the broader Internet ecosystem and economy, have been able to flourish in the United States and in the European Union because policy makers there made an important decision early in the development of the commercial Internet. They decided to heed the lessons of history and build legal frameworks that protected online intermediaries against liability for the content that their users communicate. These internationally established best practices, shielding intermediaries against liability, are worth examining, because they provide important guidance on how best to cultivate a healthy, innovative, and economically productive information society. It almost goes without saying that the power of the Internet as a publishing technology empowers lawbreakers just as it empowers the law-abiding. Just as the Internet has allowed billions of people across the globe to express themselves in new and legal ways, it too has provided a new venue for the publication of illegal material. What counts as legal and illegal speech will, of course, turn on the applicable national laws. Different nations with different cultures will often have different rules about what types of expression the law protects and what types of expression are unlawful—different rules regarding speech that is alleged to be defamatory, or obscene, or invasive of privacy, or infringing of intellectual property rights, or dangerous to national security. I am not here tonight to debate how different countries should make those decisions. Rather, I am here tonight to explain a decision made in the United States and in the European Union, a decision with which the Center for Democracy & Technology strongly agrees: that is, the decision that intermediaries should not be held liable when their customers engage in unlawful expression using their services. That decision has proven critically important to the growth and continued vitality of the Internet as an engine of innovation, free expression, and economic growth. This strong protection from Section 230 has since been used by a wide variety of online services as a shield against a wide variety of legal claims based on content posted by their users, including claims of negligence, fraud, privacy invasion, violation of civil rights, and defamation. Of course, the users who create illegal content can still be sued or prosecuted for the content they create. But Section 230 ensures that the blame lies with the originator of the offending content, rather than with the messenger who delivered it. Meanwhile, another law passed in 1998, the Digital Millennium Copyright Act or “DMCA”, provides similar protection for online services against claims of copyright infringement. Although somewhat complex in its details, the DMCA for example will provide a service provider with “safe harbor” – that is, liability protection – against claims of copyright infringement if it takes down allegedly infringing material when notified by the copyright owner. This type of intermediary liability protection is referred to as a “notice and takedown” or “notice and action” regime, and it is this model that the European Union followed when, in the year 2000, it codified its own system of strong intermediary liability protections for Internet services in the E-Commerce Directive. It is precisely these types of strong protections for online intermediaries that have led to the dramatic growth of online forums, social networks, and other interactive, user-generated content sites that have become vibrant platforms for expression in the U.S., Europe, and all over the world. Indeed, without laws like Section 230, so-called Web 2.0 services that rely on user-generated content may never have even been funded or built, either due to the fear of potential liability or the high cost and impracticality of trying to pro-actively police all of the content being posted to such services. Many of you know the story of how a young student named Mark Zuckerberg created Facebook in his university dormitory, with only a few friends and a few thousand dollars. This is the type of Internet success story that we like to celebrate, because it illustrates how small innovators can become Internet titans; indeed, it’s such a powerful story that Hollywood has already made a movie about it that you may have seen, called “The Social Network”. But it’s also the kind of story that could never have happened if Mark Zuckerberg had not been protected by law against liability for the thousands, then millions, and eventually billions of messages and photos posted to Facebook, because some percentage of those messages were and are certainly illegal in some respect. Facebook would never have survived if, in order to avoid lawsuits, Mark Zuckerberg immediately had to hire an enormous staff to try to monitor all of those communications for potential illegality. I use the word “try” because even with an enormous staff, and sophisticated technology, and all the money in the world, no communications provider could ever successfully prevent any and all illegal content from being transmitted or posted over its service. The futility of such an attempt at filtering becomes especially clear when you look at the enormous scale of Internet communications. For example, by the middle of 2011, users of Twitter were publishing over 200 million messages, or “tweets”, per day—that’s over two thousand messages a second. Similarly, in the same year, users of YouTube were uploading 48 hours of video every minute—nearly 70,000 hours of video per day. It is exactly this astonishing rate of Internet communication—this enormous flood of human expression—that makes the Internet so incredibly important and valuable, and at the same time makes the idea of intermediary liability so impractical. Certainly, Internet companies could try to monitor everything, and try—despite their lack of the necessary expertise and information—to determine what content is legal and illegal, and attempt to pre-screen everything before it gets posted. Even then, though, much illegal content would still get posted, and the companies would still face lawsuits or prosecutions for it. Meanwhile, the enormous engine of expression that is the Internet would grind to a halt, along with the Internet economy. Illegal online speech would still exist, while the unprecedented flood of completely legal expression, opinion, and information that we have all benefited from, both culturally and economically, would slow to a trickle. Countries that insist on trying to hold intermediaries liable for what their users do therefore threaten not only the democratic value of free expression but also their own economic growth. Such countries discourage the Internet companies of other nations from investing in and doing business in their country. At the same time, they make it harder for small innovators in their own country to create services that can effectively compete against those outside companies. When an Italian court convicts Google executives of an invasion of privacy based on a video that was posted to YouTube even though Google took down the video as soon as it was notified—which actually happened in 2010—it discourages other Internet companies from doing business in Italy, and also discourages Italian innovators from building their own video services. When Indian prosecutors bring criminal charges against Google and Facebook and Microsoft and Yahoo and local companies as well for hosting allegedly blasphemous online content, even though those companies were never even notified of the illegal content—which is actually happening right now—it has the same discouraging effect. When Chinese law is so restrictive that in order to try and avoid liability, major online services must employ massive and massively expensive armies of staff to try to identify and take down any and all illegal content, how can a newer, smaller, more innovative communications service ever compete? It can’t. Unfortunately, these concerns are not limited to Italy, or India, or China. Rather, and as Dr. Ramasoota and Mr. Bhadungrat will describe, Thailand risks walking this same dangerous path. The lack of clear legal protections for Internet intermediaries in Thailand’s Computer-Related Offences Commission Act or “CCA” not only threatens the Thai people’s right to free expression generally but also threatens innocent intermediaries with years of imprisonment. By threatening the messenger, the CCA also threatens Thailand’s future economic growth and its ability to compete in a global Internet economy. The next revolutionary, innovative Internet service—the next Facebook, the next Twitter, the next Google, the next company that will compete with those established giants—doesn’t have to come from the United States. The next Mark Zuckerberg could come from Bangalore, or Beirut, or here in Bangkok—but only if the law protects local innovators against intermediary liability so that they can effectively compete against American and European companies. It was true over two thousand years ago, in ancient Rome and in ancient China, and it is true here, today: punishing the messenger ultimately threatens the integrity of the network through which messages are received, whether that network is made of flesh and blood or made of fiberoptic cables and wireless signals. Unless we protect our messengers from punishment—unless we provide clear protections in law against intermediary liability—we threaten our own access to knowledge, and we threaten to stifle technological innovation in the ways that we access knowledge, making us all poorer. I want to thank you so much for allowing me to share my perspective tonight. I look forward to hearing from the rest of the experts on the panel, and I look forward to your questions.